When Melody Chalaban and her fiancée went to notify friends and family of their upcoming wedding, they did more than just point guests to a Web site. As part of the save-the-date cards they sent out earlier this month, the couple included specialized bar codes, known as QR codes. The two-dimensional bar codes, which can be scanned in with any smartphone, have become popular in advertisements, products and even as markers at points of interest. But Chalaban, a PR consultant for tech companies, thought the codes might also serve a useful function in preparing for their special day. One code on the card takes guests to the wedding Web site, while a second QR code adds the ceremony to their guests’ calendar. The couple isn’t stopping there, though. Chalaban said they are also thinking of including a code on the invitation itself, in an effort to automate the RSVP process. The one downside, Chalaban said, is that the codes are, well, a bit ugly. 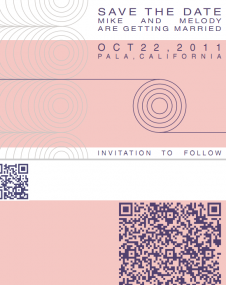 Chalaban may be a bit dismayed to learn she isn’t the first to think of incorporating QR codes into wedding invitations. Los Angeles-based Paperspring, for example, incorporates the codes into everything from wedding invitations to baby announcements, while a number of wedding forums also buzz about the approach as the latest thing since replacing the DJ with an iPod. Update: I even found someone who tried to integrate a QR code into the wedding cake. I think that might be taking things a bit too far.